This Crock Pot Pork Roast is so easy to make and comes out juicy and full of flavor. Serve over rice pilaf, mashed potatoes or pasta. Enjoy! In a small bowl, combine the salt, garlic powder, pepper,rosemary and thyme. Place the pork in a slow cooker and rub all over with the oil. Rub the seasoning mixture all over the pork. Cover and cook on high until the internal temperature of the pork reaches between 145 degrees F (medium rare), with a 3-minute rest, and 160 degrees F (medium), about 2 3/4 hours. 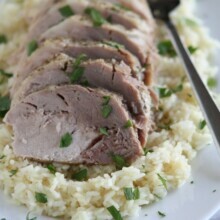 Remove the pork from the slow cooker and let rest 15 minutes before slicing and serving.